This trip up to Sheffield to see Company at the Crucible was my last booking for the year (though it ain’t over til the 31st…). Though it seemed like a bit of a faff, involving non-essential travel the day before I’m going to my parents for Christmas and coming at the end of a long, long year, there was never any doubt in my mind that I would be making the effort once the supporting cast around Daniel Evans had been announced. It really is luxury casting from top to toe – Samantha Spiro, Francesca Annis, Ian Gelder, Claire Price amongst others – and though I have recently suffered something of a Sondheim burnout, I got on the train with excitement. And how glad I am that I made the effort. There have been times over the last twelve months when my enthusiasm for theatre has waned a little, but it is productions that give me goosebumps and bring tears to my eyes that remind me why I love this medium so, and this show gave me both sensations in plentiful measure. Jonathan Munby’s production puts Artistic Director Daniel Evans in the centre of the show as Bobby, the man in the midst of a middle-life, marriage-centric crisis as all his couples friends gather round at his apartment to celebrate his 35th birthday. We then see vignettes from each of their lives, showing that married life isn’t perhaps all it cracks up to be which leaves the directionless Bobby and his coterie of female admirers more confused than ever about what he wants and what he thinks he wants. It is a true ensemble show though, and as we go round the couples, they all get a decent song or two as well as forming the chorus which means, as in Bobby’s life, they are ever-present. But for us, this is the perfect Christmas gift. Take your pick from Samantha Spiro’s ditzy Amy whose Not Getting Married is one of the best things I’ve seen all year, or Francesca Annis’ brilliantly acerbic Joanne whose coiled bitterness takes flight in Ladies Who Lunch, Rosalie Craig’s scintillating rendition of Another Hundred People, the list is endless and endlessly talented. Anna-Jane Casey (I really ought to be getting over my personal antipathy to her but it is proving difficult) also emerges well, but what really surprised me was how good the men were. Sorry/Grateful, led by the mightily bearded Damian Humbley was so beautifully tender spread across three voices, Steven Cree’s tall bi-curious Peter was good and Ian Gelder was just a delight to behold. I knew he’d be good, but theatre is also about the unexpected and getting 60 seconds of direct eye contact with him, gloriously be-sideburned, glittery-tophat-and-flares-sporting and hoofing his way through Side By Side By Side, is the kind of thing money can’t buy! The 70s aesthetic is carried through right down to the crockery in Christopher Oram’s design, and I loved the use of the illuminated squares on the lip of the stage. The balcony/terrace that adds another layer to the action at the back is skilfully used too, though I did feel for the people in the side seats during those scenes as the sightlines can be a bit punishing from there. And Daniel Evans was hugely impressive as the central Bobby, vocally assured and passionate and thoroughly believable as the man who has no idea where to turn – his final rendition of Being Alive thus gains huge added power for being all the more emotionally engaging. 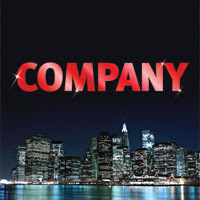 When I finally got to see the much-acclaimed Donmar production of Company in its concert version last year, I was a little underwhelmed and though Southwark Playhouse’s production was entertaining earlier this year, I still didn’t really see what it was about the show that encourages such devotion from its fan. This is the production to demonstrate to people why Sondheim is so regarded and why Company can be such a fabulous show. It regularly brought me to tears it was that good, the quality oozing from every pore but crucially this is not an exceptionally talented cast coasting through, there are working exceptionally hard to deliver one of the finest pieces of theatre I’ve seen this year. Side By Side By Side is a show-stopping, ego-free, ball of perfection that opens the second half like a dream and I wanted it to never end. So, a fitting way to end my theatrical year, and one which most likely force its way into contention for the forthcoming 2011 fosterIANs. I can’t recommend making the trip to see Company enough. There’s been lots of calls for it to transfer to London, but to my mind – as with last year’s festive show here Me and My Girl – this is a show designed for the wide open space of the Crucible which has no real counterpart in London, so get thee to South Yorkshire (The Megabus website has cheap tickets for East Midlands Trains from London which is my top tip and has meant I’ve frequently got £1 tickets in advance) where a fantastic time is in prospect for you.